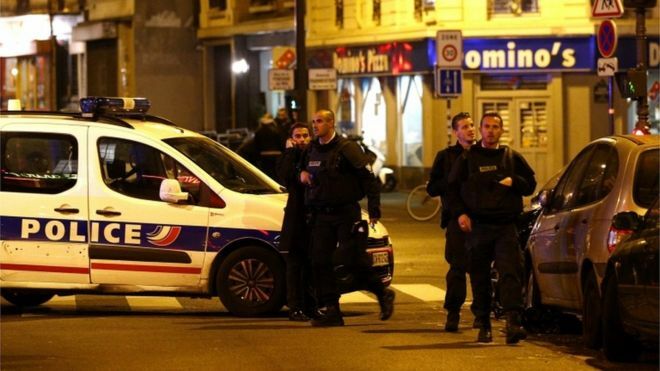 Courtesy CNN – Police move to contain terrorists in Paris. There is something truly saddening when the very worst of humanity runs loose in a city with such great history, vibrancy, and culture. This was the scene in Paris, where at least 118 are confirmed dead as of 8:00 ET, in what is easily the deadliest incident of terrorist violence in the city’s history. Scarier still is the fact that investigators have yet to truly piece together the source of the violence, but it appears, based on the accounts of those who were witness to the violence, to be terrorist assaults on popular evening destinations. The question now is, which group? Anarchists, for all their flaws, tend to avoid deadly violence because it rarely serves their own political purposes. ISIS seems highly likely; they have the finances, the means, and motivation to launch an assault anywhere on Earth. Al Qaeda is the natural next guess, but their resources have been significantly compromised in recent years, and there appears to be, at least according to several news outlets, a serious breach in philosophy by ISIS and Al Qaeda. These two groups are not at all chummy, but there lies another, far more chilling possibility. Could this be the work of a highly decentralized, but very well-organized, group of para-terrorists using social media to communicate via coded messages? We know that ISIS has used Twitter and Facebook as recruiting tools, but could it be that another splinter faction, affiliated with either ISIS or another group, has decided to go “low tech, low budget” in a way which can inflict maximum damage? Remember, it doesn’t take a lot of bullets, relatively speaking, to cause a mass casualty event. It also doesn’t take a lot of know-how to build primitive bombs if one knows where to look. Finally, and this is what we in the states need to consider, this attack is more than just about killing – it is about instilling fear; disrupting the normal course of life so people wonder “what’s next.” At the risk of speculation, there’s a lot of potential worst-case scenarios, and the French need to rule each one out as fast as possible. This is what should happen and, hopefully, the French are already on top of this; the source of the weapons tracked, the source of the money is tracked, and these bastards are taken down with all deliberate force. Next, track the communications methods, crack any codes and pictures, and take the fight back to them. I don’t care if it’s Islamists, anarchists, or simply a group of thugs with a bloodlust. While I’m usually a hair off full-out liberal, this is a moment when we find the source, and a send a clear, concise, and devastating blow in the most convincing fashion possible – mess with a peace-loving society, and you will find out just how mighty the sword of justice can truly be. My prayers are with Paris, la belle France, and all those who have loved ones in the City of Lights tonight. Please, #StandwithParis and post your pictures of Paris and France to social media. Love trumps hate, and Paris is considered the most romantic city on Earth. While I sometimes poke fun at Paris’ expense, our brothers and sisters in France need to City of Light to be lit with hope now. I do hope to visit there someday with the one I love, so I will stand with Paris in, as the French would so elegantly say, fraternite et solidarite. ← Announcing Green Weenies 5: Now Taking Nominations for…eew, Max!!!! This is all very sad and troubling. You make a good point about how the terrorist attacks in Paris follow so closely on the heels of the downed Russian airliner.